This week's post is up at XE.com. A little more deceleration from summer's strongly positive data is evident. As you probably already know, 2Q GDP was revised higher again, to 4.6% This equals the best quarterly reading since the economic recovery began 5 years ago. ....If Q2 is up only 2% YoY from Q2 2013, that will be $15.99, a +1.1% increase from today's Q1 number, or +4.4% q/q annualized. If it were to return to the increasing trend line of +1.33% quarterly real growth from the prior 3 quarters of 2013 it had before Q1 2014, that would be $16.31, a +3.1% increase, or +12% q/q annualized!!! (not gonna happen, but worth pointing out). So, as I say from time to time, you're reading the right blog. It's still worth noting that before 2000, 3% or higher GDP growth was the norm. The chart above shows the ratio of the IWMs (Russell 2000) to S&P 500 (SPYs). Since the beginning of the year, his ratio has been declining, indicating a declining risk tolerance on the part of traders. I have a new post up at XE.com, about this morning's blowout new sales report, as of now the best since 2008. Contain your enthusiasm, and bookmark this post for one month from now when the revisions come out. It has now been a full three years since ECRI announced that the US was "slipping into recession" "now" and in fact "it might have [already] started." The full catalogue of ECRI's pronouncements can be found in my post one year ago on the two year anniversary of their epic faceplant. Still, the quantitative and sequential long leading/short leading/coincident/lagging indicator approach they inherited from their founder, Prof. Geoffrey Moore is one of obvious merit. In 2011, they made the human error of reading the temporary air-pocket caused by the debt ceiling debacle as something more lasting. Last year I made a plea that they consider a "recession 2.0" watch. That watch would be premised on the idea that, even if their existing call is wrong, the new data when it occurs will justify a recession call totally independnent of their pre-existing 2011 recession call. This is the approach ECRI seems to have adopted, no longer focusing on attempting to justify their 2011 call, but simply looking forward from the data now. I approve. Historically, the market is not overbought, but is clearly expensive. The S&P 500 PE ratio is 19.93 while the dividend yield is 2%. And the price to book value is 2.81. The PE ratio is pretty stretched above the median level (14.5 verses 19.4). All of these numbers tell us what we pretty much already know: we're pretty far into this bull market; we're not going to find any cheap companies. 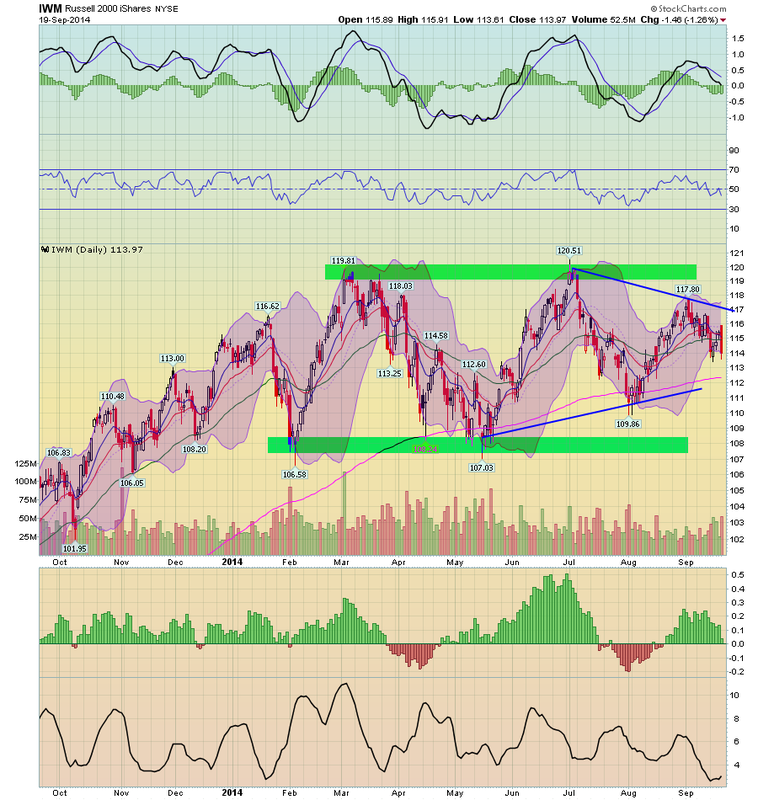 The IWMs (Russell 2000) continues to be the index to watch for "real" market sentiment. The market has been consolidating since the Spring with a high in the upper 119s/lower 120s and low of 106s/107s. In addition, a prices are consolidating in a triangle pattern, with trend lines connecting the lows of May and the highs of July. 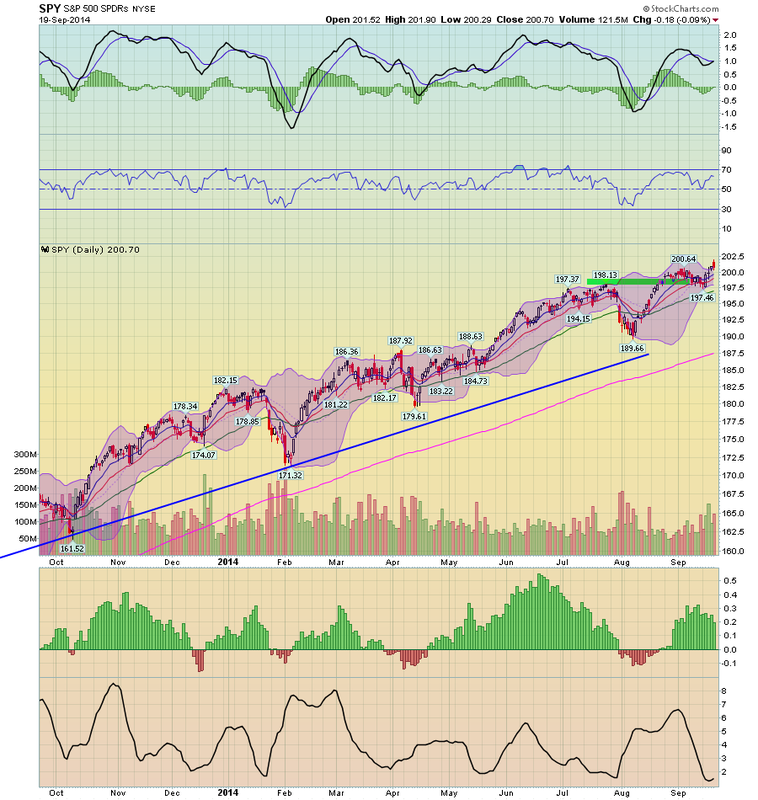 The MACD his been trending lower since the July highs as well as has the RSI. We need to see a strong move above the 120 level or below the 106/107 level to get a better read on what this market really wants to do. And so long as we're on the IWMS, let's take a look at important moves in the 5 minute weekly chart, comparing the SPYs and the IWMs. The SPYs were in an uptrend all week. On several occasions they moved off the 200 minute EMA, using it as technical support. 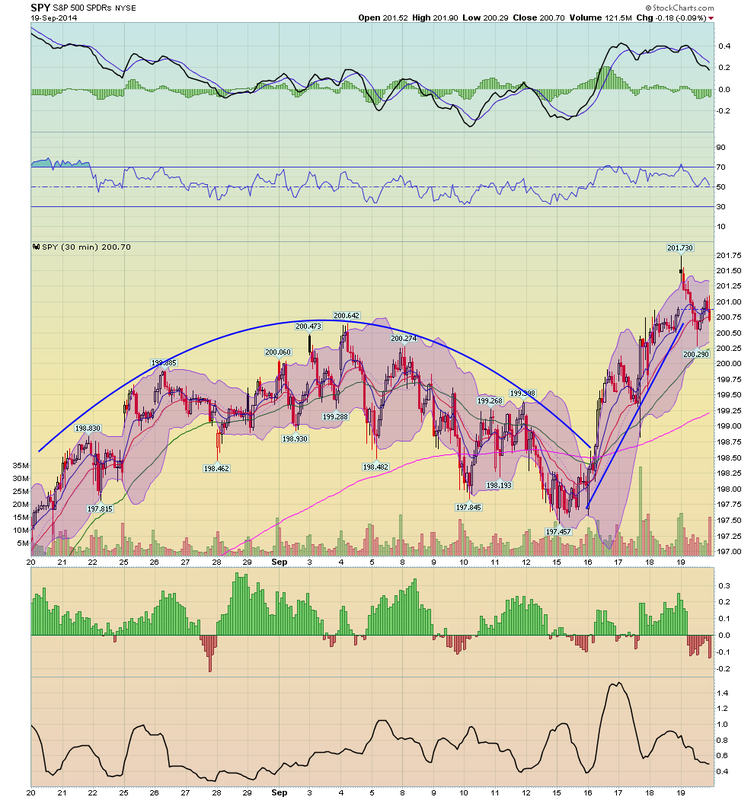 The 200 minute EMA was in an uptrend as well. In contrast, note the sharp sell-off in the IWMs on Friday, and compare that to the SPYs sell off. The IWMs moved through the 200 minute EMA and continued lower until they were near the weekly lows. Only then did they rally. But the rally was only a bit stronger than a dead cat bounce, hitting resistance at the 50 minute EMA. And, the 200 minute EMA moved lower on Friday, in contrast to the SPYs. The 30 minute SPY chart can be broken down into two patterns, with the first being a price arc lasting for the first ~2/3 of the chart, as prices rose from the 197.25 level to the 200.6 level and then fell back to the lower 197s. But last week, in anticipation of the Fed's statement, the market rallied for the better part of the week. 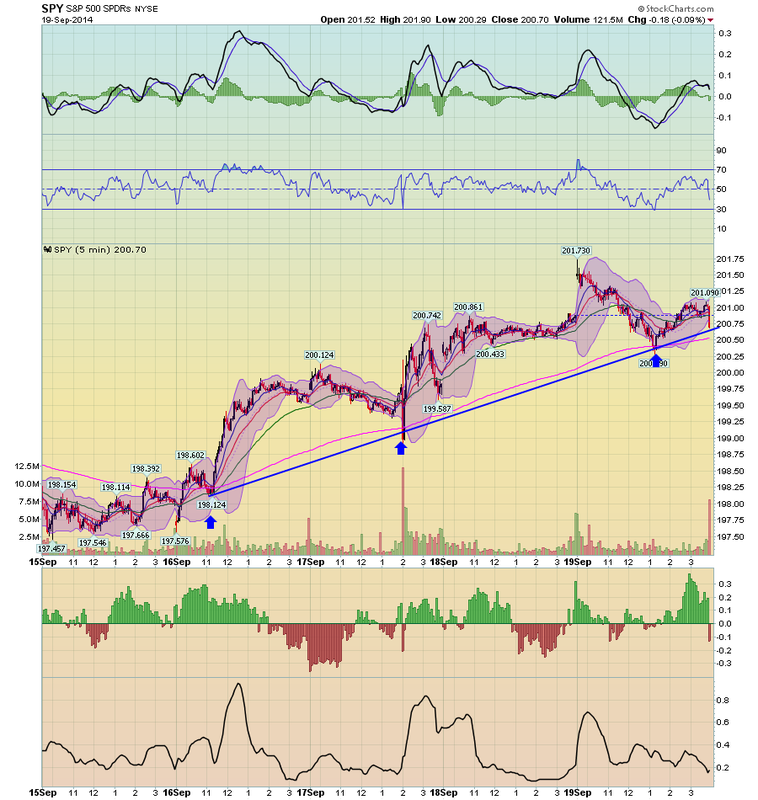 On Friday the market gapped higher, but then traded a bit lower. Compare the SPY price chart to the IWMS, which have been in a downward trend printing lower lows and lower highs since the beginning of September. ﻿This is a pretty disciplined sell-off, meaning the bull/bear balance is only slightly balanced towards the bears. But it also indicates that risk appetite is weaker than we'd expect, especially if we're anticipating a stronger move higher. The overall annual uptrend is intact. Prices consolidated over the past few weeks, but moved through upside resistance on Thursday. 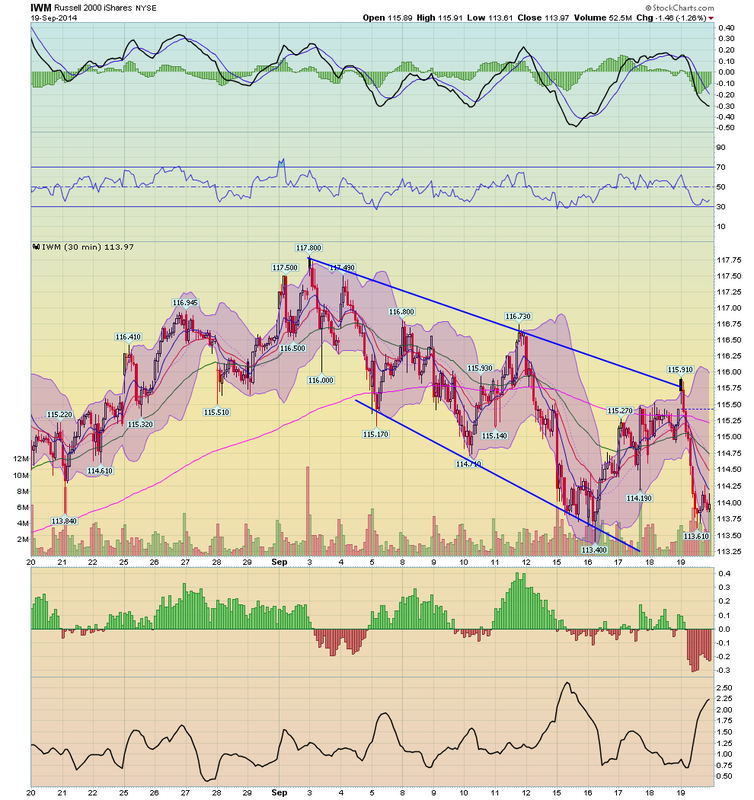 The MACD is about to give a buy signal, and the RSI has room to move higher. This chart is pretty bullish. But remember the overall environment discussed above. The market is expensive and there is clearly a diminishing risk appetite that will hold back gains. Overall, we need more fundamentally bullish news such as corporate earnings growth, stronger employment numbers or overall GDP growth to keep moving consistently higher. 1. There is no political will to do anything to assist the economy, e.g., infrastructure repairs and upgrades, assistance to the middle/working classes. Back in 2009, Bonddad and I jointly called for the creation of a new WPA to help ameliorate the worst unemployment situation in 75 years. It become pretty clear by 2010 that none of the things an activist government might have done were going to happen, beyond the 2009 stimulus. I haven't seen the point in arguing in favor of any progressive economic agenda items that not only aren't going to happen before 2016, they almost certainly aren't going to happen before 2020 as things stand now. The best we can hope for in the foreseeable future is that Washington does no further damage to the average American's well being, with further spasms of austerity (e.g., cutting off extended jobless benefits) or downright recklessness (threatening to refuse to pay the US's bills). 2. Since Washington isn't going to be of any assistance, this is the economy we have. It has been, is now, and is probably going to continue to grow at 2% or so, give or take. Jobs will probably continue to grow by about 200,000 a month, with the occasional upside or downside outliers. The various unemployment rates will probably continue to slowly decrease. Real wages will continue to be flat to slowly rising. The slow growth is the result of a number of factors: the global race to the bottom, the ever-increasing concentration of wealth, continuing advances in automation, the secular increase in the price of Oil, and an aging population not only in the US but throughout the developed world (older folks don't buy nearly as much new stuff as younger folks who are making a new home and raising children). The slow growth we've experienced since 2009 isn't going to change for the better in the immediate future. On the other hand, there is no sign that it is about to change for the worse. 3. While we are probably past the middle of the cycle, this is hardly shocking 5 years after the economy started to improve. The typical spending patterns I would expect to see as the cycle wears on have happened - e.g., a slow decline in real consumer spending, and a general plateauing in the purchase of vehicles. But that doesn't mean The End is Near. In fact, one of the noteworthy things I've noticed in the last few months is the virtual disappearance of Doomer commentary. It's so bad I actually have to go over and read Zero Hedge to make sure it still exists. So let me tell you what I think reasonably could change the present dynamic for better or worse in the near future. Even lower long term interest rates (refinancing, home purchasing). Long term treasuries bottomed at 1.74% in mid 2012. Mortgage rates made a bottom just over 3% shortly thereafter. Corporate bonds yields also made lows in 2012. Recently corporate bonds in particular have come near those lows. A new low in bond yields would send a powerful signal that the expansion is going to continue for awhile, especially with the inevitable new round of refinancing of consumer debt at lower rates. Gas prices declining under $3/gallon. Gas prices are like a tax on consumption. The less consumers spend on gas, the more they can both save and spend on other stuff. A significant rise in median real wages. This would be nice. I just don't see it in the near future (except as a byproduct of a further fall in gas prices). Hence, not a third candidate. 5. On the other hand, what are the most likely trends that would cause an economic downturn? Well, first of all, the reverse of the two items I listed above. Higher interest rates would bite into consumption, as would higher gas prices. "Conundrum 2." If the Fed actually starts raising short term rates while long term rates are declining, that would create one of the classic signs of a recession coming - i.e., a flat to inverted yield curve. If it happens in a deflationary environment, that would be even worse. Such a yield curve has only happened twice in the last 90 years -- in 1928 and 2006. That's why I call it the "Death Star." The combination of no increase in wages, no new lows in long term interest rates so no refinancing, together with a significant downturn in stock prices lasting several quarters. This is the most likely scenario. By next summer, we will have gone 3 years without consumers having been able to refinance debt at lower interest rates. Since 1981, this has been the sine qua non for a downturn. When the inability to refinance is accompanied by no wage increase, and no increase to new highs in widely held assets, in each case a recession has followed. At the moment, house prices are still increasing, but not nearly to new highs, and there is very little home equity withdrawal going on, so that is not a source of consumer funds. On the other hand, stocks have been making new highs all this year. This appears to be having a pronounced wealth effect among the affluent to wealthy households that own stocks, and is fueling consumption (although none of that is "trickling down" to the bottom tiers). In conclusion, unitl one of the above scenarios finally tips the balance, growth will wax and wane. I still think there will be deceleration in the remaining part of this year. An uptick in the first part of next year looks more likely than a continued deceleration.